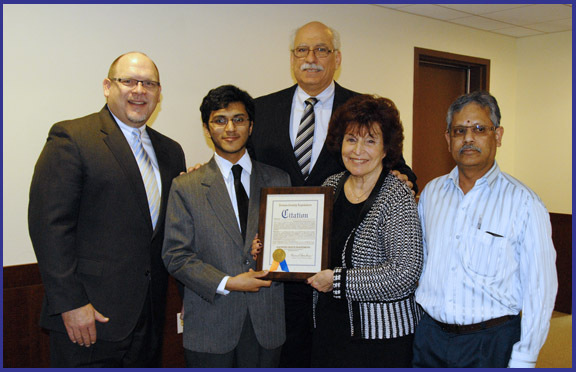 At a recent meeting of the Nassau County Legislature, Legislator Dennis Dunne, Sr. joined with Presiding Officer Norma L. Gonsalves to honor Ganesh Ravichandran, a senior at W.T. Clarke High School in East Meadow, in recognition of his being named a 2014 Intel Science Talent Search Semi-Finalist. For his project, Ganesh traveled to the California Institute of Technology in Pasadena to use images captured by high-tech cameras to build a catalog of stars in the “Milky Way.” In total, Ganesh spent 6 months creating a computer program that allowed him to sift through more than 1,100 images in order to ferret out discrepancies in other scientists’ data and give a clearer understanding of the universe. Pictured (l-r): W.T. Clarke High School Principal Tim Voels; Intel Semi-Finalist Ganesh Ravichandran; Legislator Dunne; Presiding Officer Norma L. Gonsalves; and Ganesh’s father, Krishnaswamy Ravichandran.